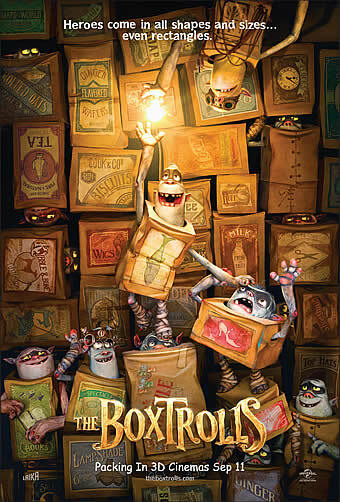 Synopsis: “The Boxtrolls" is a comedic fable that unfolds in Cheesebridge, a posh Victorian-era town obsessed with wealth, class, and the stinkiest of fine cheeses. 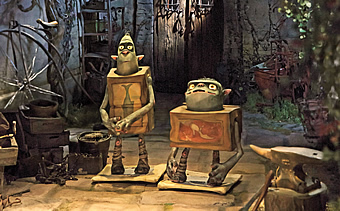 Beneath its charming cobblestone streets dwell the Boxtrolls, foul monsters who crawl out of the sewers at night and steal what the townspeople hold most dear: their children and their cheeses. At least, that's the legend residents have always believed. 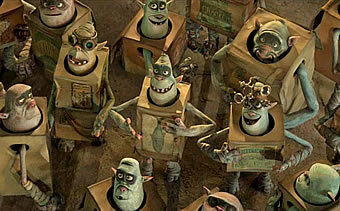 In truth, the Boxtrolls are an underground cavern-dwelling community of quirky and lovable oddballs who wear recycled cardboard boxes the way turtles wear their shells. 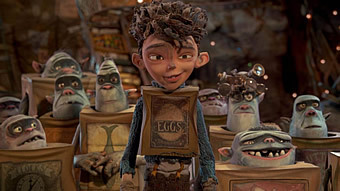 The Boxtrolls have raised an orphaned human boy, Eggs (voiced by Hempstead-Wright), since infancy as one of their dumpster-diving and mechanical junk-collecting own. 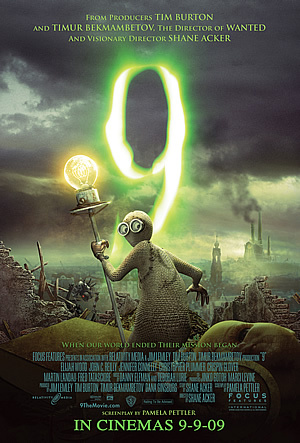 When the Boxtrolls are targeted by villainous pest exterminator Archibald Snatcher (Kingsley), who is bent on eradicating them as his ticket to Cheesebridge society, the kindhearted band of tinkerers must turn to their adopted charge and adventurous rich girl Winnie (Fanning) to bridge two worlds amidst the winds of change - and cheese. 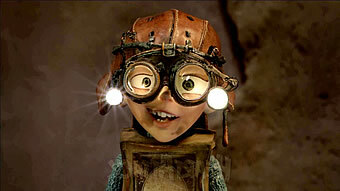 If you haven’t yet seen ‘Coraline’ or ‘ParaNorman’, it may take you a while to get used to the world of ‘The Boxtrolls’. 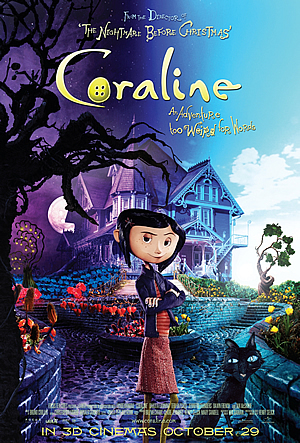 The third feature from Oregon-based studio Laika Animation, it is told using the same stop-motion technique (with some CG and hand-drawn work) as their earlier films, but the similarity doesn’t quite stop there. Yes, once again, the animators have eschewed the cuteness of Disney or Dreamworks for something much darker than your normal kiddie fare at the Cineplex, and therein, we would argue, is the reason why it proves so uniquely charming. Adapted from British children’s author Alan Snow’s fantasy adventure ‘Here Be Monsters!’, it retains the Steampunk setting of the novel but takes quite a few creative liberties. Instead of an over-industrialised Ratbridge, the city in question is Cheesebridge, so termed because the dairy product is what separates the rich in “White Hats” from the poor in red ones. What unites the humans across their class distinctions is the subterranean Boxtrolls, little blue-skinned fluorescent-eyed creatures who emerge from the sewers at night to swipe anything and everything they can get their hands on. So named on account of the cupboard boxes they wear their bodies, the Boxtrolls are feared by the humans as much they fear the humans. The fear of the former is stoked by none other than Archibald Snatcher (voiced by Ben Kingsley), a truly detestable rascal who is responsible for spreading nasty rumours about the Boxtrolls in order to justify his eradication for a coveted place with the “White Hats” and a seat with them at the cheese tasting table. As you can probably guess, their leader is no saint either, but rather a self-absorbed aristocrat by the name of Lord Portley-Rind who cares more about his Gouda and Brie than the welfare of his citizenry. It’s a lot of setup, but co-directors Anthony Stacchi and Graham Annable deftly lay out the intricacies of their make-believe world while setting the narrative in motion. 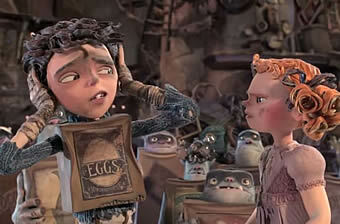 For reasons only revealed in a crucial flashback sequence later, a boy is taken as a toddler under the care of the Boxtrolls and is named Eggs after the carton he wears over himself. 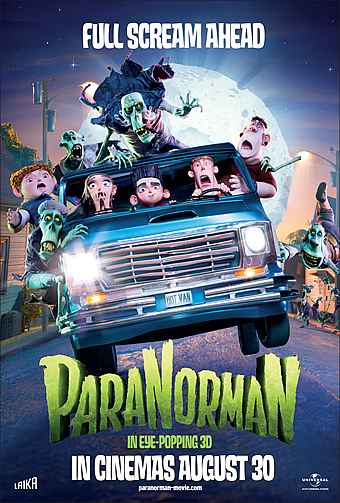 While on the prowl one night, Eggs runs into Lord Portley’s precocious daughter Winnifred (Elle Fanning) who is shocked that a human would be associating himself with the dreaded Boxtrolls; but before she can make his acquaintance, Eggs is forced to flee from Archibald and his henchmen. As such stories go, Eggs sets off on a quest with Winnifred in tow to convince the humans that the Boxtrolls aren’t sinister beings who kidnap children. To top it off, Archibald turns out to have a nefarious scheme after all, building a contraption to assert his authority over Lord Portley and demanding that he be given the latter’s white hat. But parents need not worry - writers Irena Brignull and Adam Pava don’t deny the kids of a happy ending, though not before subjecting them to some grotesque images that may just make them swear off cheese for some time. Consider this as fair warning - visually, this isn’t cast in the same mould as the usual CG animation, and one might even go as far as to say that ‘The Boxtrolls’ operates in a realm of ugliness. But once you look past the cruder-than-usual designs, you’re likely to find the cardboard-wearing critters surprisingly endearing by their guile and naivety. We urge you too to pay attention to the dazzling production design that makes up the world of Cheesebridge and the underground lair in which the boxtrolls call home; there is a whole cornucopia of details that will leave you wowed if you pay attention to them. Still, compared to their earlier features, this latest lacks the heart and poignancy that made its predecessors memorable. Eggs never comes across as someone whose plight we would sympathise with, nor for that matter is Winnifred a likeable enough character. The way the boxtrolls communicate in an Ewok-like language is amusing all right, but they are lacking individually in any defining personality. 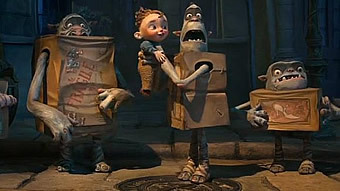 Because we never quite understand the reason why the humans so fear the boxtrolls, their eventual reconciliation doesn’t quite resonate as it should. It isn’t that ‘The Boxtrolls’ is underwhelming though; against a surfeit of clean-cut CG animation, its stop-motion aesthetics make it a refreshing change of look. Rather, because its earlier two adventures were such singular accomplishments, Laika’s latest seems more like a walk in the park. 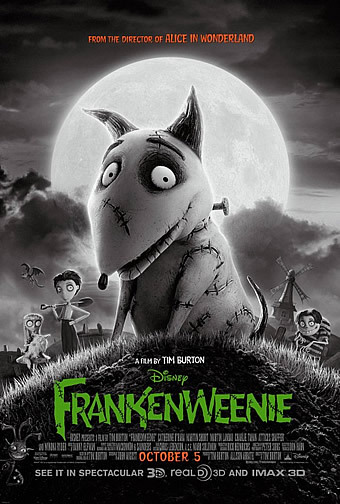 Yet its refusal to be boxed in (pun intended) by conventional animation features is still evident in its design as well as its choice of themes, and if there ever were need to prove that it is possible to be both grotesque and charming at the same time, then ‘The Boxtrolls’ would be it.